A do anything, go anywhere bike that can have fat tires and do a cyclocross race; throw on a set of skinny tires and hang with the roadies; or put on some wider slicks, some fenders, a dynamo, and a trailer and do a tour of the US or world. This bike only goes on the road and it's fast, light, nimble, and has the best tech that you can throw at it. Electronic shifting, fat carbon rims, and counting each gram for each piece. Sadly #2 is not really possible for me right now. Between the high price of electronic shifting and carbon rims, combined with the fact that to make a light bike like that I would have to use much more expensive custom-made carbon fiber or titanium, it's just out of my price range. So that leads to the do-anything bike. One area where bikes for tall people often fail is how they look. Take me. Unless you have something for reference you could see a picture of me and I wouldn't look very different from anybody else. Sure I'm taller, but I'm also wider and deeper. I've got bigger hands, wider shoulders, longer feet, and a huge brain. So if all of me scales, why is it that when people think of a bike for a tall person they only think to make it taller, even dangerously so. If you simply made a taller person by just stretching them up and not adding anything else then they would easily break, topple, or otherwise be maimed. It just doesn't work that way on people, and in my opinion it shouldn't work that way on objects used by those people either. One of my top goals on this project was to figure out how to make a bike that managed to not only get stretched upwards, but also lengthen and get stronger to accommodate my larger body. To do this I started fairly basic. I looked at some of the bikes that inspire me: Specialized Roubaix, Salsa Vaya, Cannondale CAAD10, Soma Double-Cross, Specialized Crux Disc, Fixie Pure Blood, and a few others. From there I looked at their model that would best fit a normal 5'9" rider, usually a 56-7cm frameset. 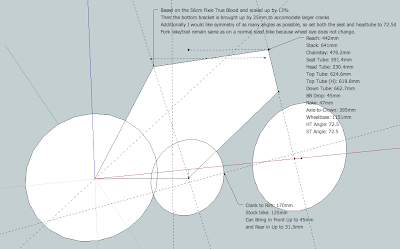 From there I broke down the bike as a set of proportions instead of raw dimensions. Note: One thing of interest is that there is actually a very very finely tuned window of fore-aft weight distribution of bikes as it relates to the bottom bracket (BB) position and the overall wheelbase. Faster road bikes will put things at 59.5% fore and 40.5% aft of the BB, and more relaxed tourers are at about 58% fore and 42% aft of the BB. This is a surprisingly narrow window between twitchy sport and relaxed tourer. But what was even more surprising was that bikes for tall people are often 61% fore and 39% aft of the BB. Meaning there is as much difference between a touring bike and a twitchy fast bike as there is between a fast bike in a normal size and a fast bike in a tall size. This basically means that tall bikes are less stable and even more twitchy even in the same models than they should be and by a fairly drastic margin. Once I had a good idea for what the proportions were I then scaled up by 13% (5'9" x 113% = 6'6"). This yielded some interesting results and while not a hard blueprint did provide the guidelines for what I was looking for overall. I was aiming for a bike that had a wheelbase of 1100-1150mm (vs 990-1010mm for normal guys) and a chain stay (that back piece from Requirement #2) that was about 450-480mm (vs 400-420mm for normal guys). 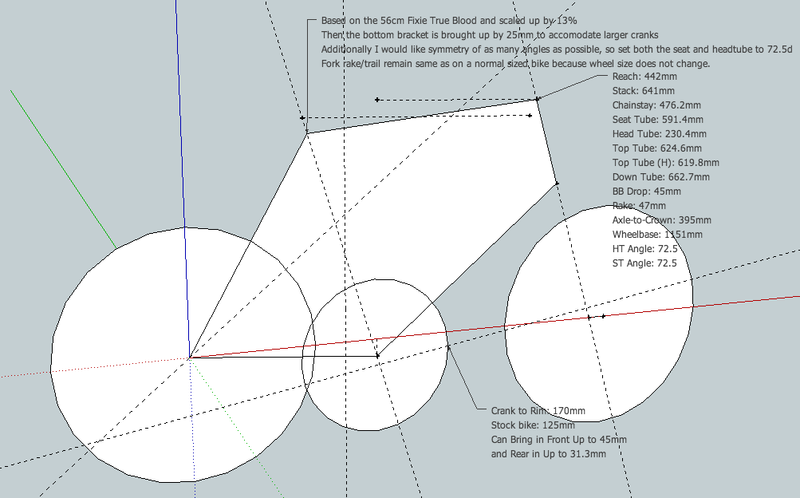 I then mocked up the scaling in a CAD application and everything looked great, except for one piece...the wheels. Unfortunately you can't scale the wheels; therefore things did look pretty much the same on the scaled version except for that the wheels looked a bit smaller and to keep the same height from the road those smaller wheels have to be pushed down a bit. All-in-all though the scaled version of the bike seemed to work very well both mathematically and as a model. One of my CAD drawings. While larger than normal it's not gangly. When things work right as math and also look right on paper, then you're in good shape. Therefore, I was pretty happy to move forward in the Looks Proportionate department. From having ridden around on my current bike for a few thousand miles there is one thing that was number one on my list of must-not haves...Cantilever Brakes. They're hard to set up, prone to squealing, and are terrible in the wet. 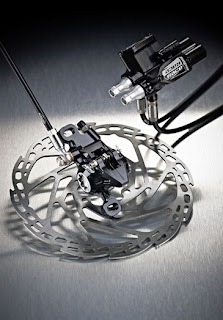 Fortunately there's been a bit of a move in the road-biking world to get disc brakes on bikes, and that really seems like the way to go for me. You get much more consistent braking (even in wet conditions) with discs and you can brake with much less effort. In my mind discs brakes are simply the best way to stop a moving wheel, and the main reason that you don't see it on more bikes is people waiting out to see if the new tech will stick. Additionally I really wanted hydraulic disc brakes, but when I started looking into building a bike they didn't exist for road bikes. Hydraulic brakes provide better control of your braking power, which is something I really crave given how little of it there is in my current cantilever brake setup. Sadly though, nobody (yet) makes hydraulic brakes for a road-bike, so this definitely poses a problem. But then as time progressed in the build process something very exciting (to me) happened. During EuroBike 2011 there were many manufacturers that came out with cable to hydraulic conversion systems. This opened the door to use standard road-bike levers, but get to have the advantages of a hydraulic braking system. Another added bonus is that the overall weight of the system is less than that of a cable-pull system all while giving more power with existing pieces. Best of all worlds! The only real downsides were that these products only existed in prototype form and that prices weren't released. So these were mostly a dream. But the disc brakes were going to happen even if I had to use the lowly Avid BB7. To run discs means you need them in front and rear. 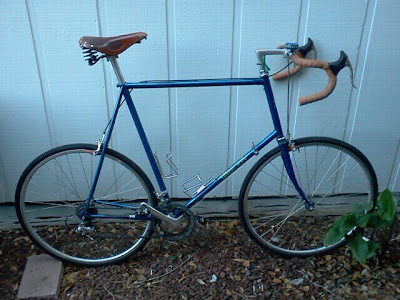 But another challenge of this build is that when I started the only possibility of getting disc brakes on the front would be to use a steel fork. Steel is great for a lot of things, it even makes a decent fork. But the best material for a fork on a bicycle is far and away carbon fiber. (Carbon Fork Strength vs. Steel Fork Strength). If possible carbon fiber is the best way to go by leaps and bounds for this piece of the puzzle. After having all of my frames get scratched up by their cables at some point or another I've decided that's enough. I don't care if it makes my next bike weigh more, I want all of the cables to be internally routed. That way you only see the cables controlling the gearing and brakes come out of the handlebars, disappear into the frame and then only re-appear near where they are actually being used. I like the clean look it gives the bike, plus it allows me to use full-length cable housing which will mean that my cables are less likely to get blocked up with dirt and grime. Now that I know what I want and how I want it done, it was time to go and find somebody that could help me turn these pieces into a reality. Hey Otis, cool to see that I am not the only one looking into hydraulic disc brakes with a drop bar bike. How much experience do you have with the mech/hydraulic converter (e.g. the Hope V-Twin, or others)? Did you ever use one? I'd like to know how the brake will feel, and if I'll get the sharp modulation I know from my other flat bar bikes with hydraulic discs. 1. Pull of the lever is smooth, then touches the disc. 3. Increasing pressure increases the pressure on the disc. 5. Modulation is also really nice when you're in a pace-line as it's a lot easier to add just a touch of braking to keep from bumping into the guy in front of you. 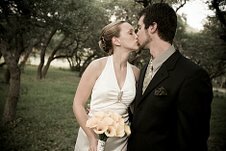 Interesting blog...similar in style to my line of thinking...love the reasoning. I am regular sized, but am also looking at similar builds...am about to settle on Soma Double Check Disc with Hope V-Twin brakes....was researching the brakes and landed on your blog. Any further progress since? I have seen the next entry. And would be interested if you have further thots on v-twin. Which rotors did you end up with? Hope rotors are very large...180mm and up...most people think overkill for road. My bike is built now have about 2000mi on it over the past 7 mo. I really like the Hope V-Twin setup, it's also really nice to have hydraulic if you plan on switching wheelsets. Just pump the brakes on the new hoops and you're realigned. The Soma Double Check Disc is an excellent looking bike, I'd likely have had that on my short list if I wasn't as tall. Everything's built, I've just been lazy with the posting. Regarding the rotors used. I started with Hope Floating 160mm rotors front and back, but because I'm 215lbs, it just wasn't enough power up front. So I switched to 180mm rotors. Unfortunately the aluminum carrier on the 180mm was too large for my fork and scraped, so I went for a Shimano IceTech 180mm rotor on the front and it's working excellently. I have tons of stopping power, plus the pads don't seem to heat up much at all on descents. Some people think that large rotors are overkill for road, but personally I would disagree. 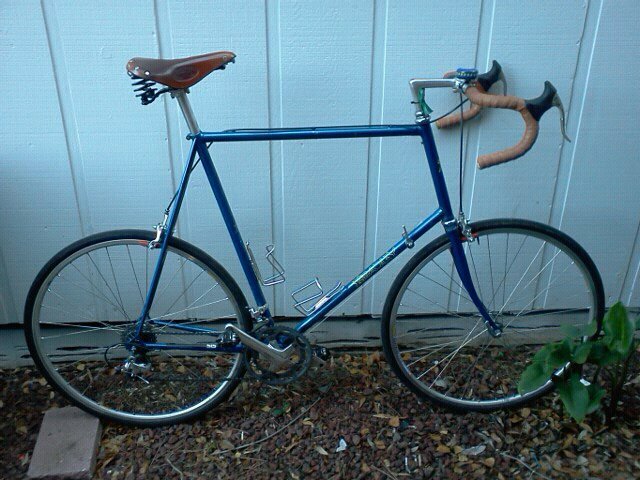 Now that I have my bike I would say the ideal road setup should probably be 180 front and 140 rear. I think the people saying 180 is too big are mostly weight-weenies. Other option would be to do really small carbon-carbon brakes (like used in F1), but we're definitely not there yet.